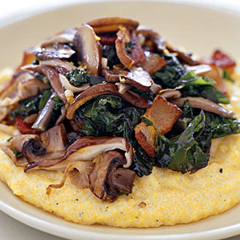 Kale and Mushrooms with Creamy Polenta | Relish! Doesn’t everyone need more polenta in their life? In a large pot of boiling salted water, cook the kale until tender, about 6 minutes. Drain and set aside. In a large saucepan, bring the milk, water, and cornmeal to a boil over medium heat, whisking constantly. Reduce the heat to low and simmer until thick, stirring occasionally, about 20 minutes. Meanwhile, cook the soy bacon in a medium skillet over medium high heat until crisp. Remove to a paper towel to drain, then crumble. Drain bacon grease from the skillet, if there is any. Add the mushrooms and olive oil to the skillet and stir in the kale and the bacon. Add the garlic and broth and simmer over medium heat until the broth is slightly reduced, about 6 minutes. Stir in thyme and season to taste with salt and pepper. Whisk the butter and Parmesan into the polenta and divide among the plates. Top with the mushroom mixture and serve.